Sometimes you go for it hard and succeed. Other times you fall flat. Every now and then you land somewhere in the middle. That pretty much sums up my Potawatomi 100 race. I went into this race in really good shape. I'd trained hard through the rough winter (feel free to check my last post for more details on that). I was as ready as I could have been. I went out at a comfortable pace but was not just taking it easy. I ran the flats and down hills and power hiked the climbs. This was my mode for the entire race. Take what the course gave me and execute in those areas. Everything was going to plan. I was getting food in early and often and was pushing the fluids. Unfortunately my stomach had been a little grumbly the entire day before and through the night. I made some not so great food choices due to travel and while I can't lay all the blame here, I know better and should have brought my own food to cook/eat for the day. I was feeling really rough and felt like my food was not going anywhere. I just kept feeling fuller and fuller. My energy was really down and I even laid down on the ground at one point. Eventually the stomach revolted around mile 57 and I unloaded everything. This actually helped a lot. I was feeling better and running again. I let things settle down and worked to consume but I was walking a tight rope with it. Luckily I had my great crew of Tommy and John out there who were keeping me motivated and moving despite feeling really rough for the back 1/3 of this one. Most things were making me nauseous so I stuck to a diet of soup and soda. All of this held up well until 80 miles where I unloaded again around mile 80. I didn't eat again for the rest of the race. A little over 16 hours in and I couldn't stomach any more calories. Everything that went in immediately made me sick so I decided that I was done with food. My legs were shot and my energy was really low but if I could avoid slowing down from being sick then I could just keep moving and get this thing done a little faster. I felt empty but we all have enough fat in our bodies that we can keep moving especially when we are not anaerobic so I just kept that in mind and kept pressing. Run (or attempt what appeared to be) the flats and down hills and hike the up hills just like I started this thing. I wanted to win the thing but that was out the door. My goal time was gone, and I just felt like a pile of garbage. I wanted to drop from this thing more than once. However I had people helping and believing in me to knock this thing out. Plus I trained a whole bunch for this moment. As Tommy says "these things don't start until 60." I wasn't going to let a less than perfect day (which is about what I would have needed to hit my goal time) keep me from finishing. I crossed the finish line 2nd in a time of 21:25 (Brandt Ketterer took first in a great time of 19:45). A new 100 mile PR on a much harder course then my previous PR time. That was also over 4 hours faster than I ran this race 5 years ago. It also appears to be the 6th fastest 100 run in the race's 12(?) years. I'll take it. A less than ideal performance turned out to be a very solid day that I can look back at and see tremendous growth. Through all the adversity, I ran a good race with a strong first 50 and really had to dig deep to keep driving when the wheels came off. It is not very often that a person really lays it all out there to attempt something not fully knowing the outcome . I personally can say this is the first time I have done so. It didn't go exactly to plan, but the outcome was still extremely positive. I learned some things about myself. I made some mistakes. I know more what my training needs to look like to get to where I want to get to. I wouldn't know that if I just went out there and played it safe. The last few months have not been ideal training weather if you needed to be highly motivated. Below freezing temps, layers of ice, and inches of snow have been the normal for several months now in what seems to be a winter that will not let go. Just last night a bit of snow fell and dusted the ground causing us to almost forget that we were enjoying the sun on bare arms in the 70 degree temps just over a week ago. Luckily I have been highly motivated.2013 was a bit of a bust when it came to running. With the exception of a fairly well executed Big Horn 50, I do not have a lot of fond memories of my training or racing when I look back over the calendar. My year started off with a bad case of shingles that took several months to get over then some minor symptoms of upper abdomen cramping that hung around the majority of the year and I still deal with from time to time. I have mostly learned to deal with these and can spot them as they are coming on, but it took a bit to figure out.I am fortunate enough to hang with some really good runners who had excellent 2013 seasons. I was able to train with them and in some cases crew or pace them in their respective victories. Watching them excel and move beyond what they had been the year before while I failed to progress as planned was humbling.I sat back an took a look at things. What was I training for? To go through the motions? To say “I’m an ultrarunner” as a group to fit into? No, it’s because I love it. I like putting my head down and grinding it out. I love the scene, the scenery, the people, reviewing gear, putting on races. I want to keep pushing when the normal response would be to stop. I don’t just want to run, I want to race!A junk 2013, two great friends pushing their limits, and a rekindled love of going long is why I have been highly motivated. With the garbage weather so far it would have been fairly easy to find the excuses to back off a little or skip a long run because it was 10 degrees at the start, but I didn’t. I held myself accountable to being better not just staying the same. Next Saturday on April 5th I’m going to let it fly at the Potawatomi 100. A highly familiar venue. A course where I ran my first ultra (30 miles), my first 50, and my first 100. Weather is always a toss up but I've dealt with the winter snow and the bone chilling temps for months and I’ve seen this course in every condition over the years from heat to speed sapping mud. I’m as mentally focused on this as I can be and my training is there in terms of quality and quantity. Last week was my highest volume training ever at 101.4 miles and close to 10k of climb in a hair under 16 total hours. I’m feeling great as I go into my taper. I’ll be making food, sleeping, and hydration high priority as I try to not bounce off the walls and irritate my wife while anxiously waiting for that start gun to go off. I was highly motivated to train. I did that. Now I am highly motivated to race. Potowatomi Trail Runs is the renamed McNaughton Park Trail runs. After an RD change a few years back, the current RD's gave a new name to the races but kept the course which runs though McNaughton Park in Pekin, IL. Why do I call this out? Mainly because it's a little confusing that there is currently another race in Vermont that has the McNaughton name. I ran Potawatomi 50, in McNaughton Park, located in Pekin, IL, not Vermont. Cool? Ok, let's do this. 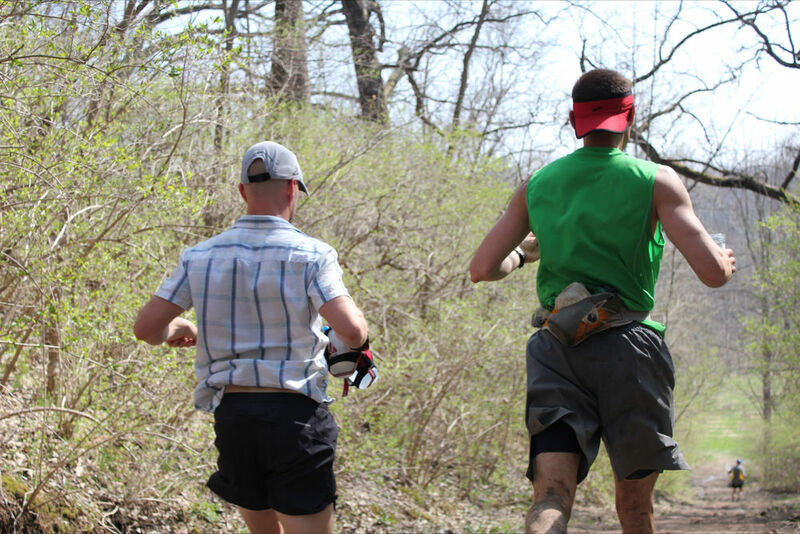 The course is a 10 mile loop that is either single track or wide grassy prairie. There are a lot of hills that add up to about 1600 feet of climb per 10 miles. None of these hills are very big. 150 feet of climbing would probably be the biggest of the bunch, but they are all really steep to going up and coming down. I've run this course a lot. This was the place where I ran my first ultra (and trail race) back in 2006 when I limped my way though 30 miles. The following year I decided to train to run longer trails races and took on my first 50 where I completed it in 11:24. This course is also where I ran my first 100 so to say I know my way around would be a fair statement. My goal in this race was to really take a look at where I stand today versus my first 50 5 years prior. Race conditions looked great. There was a 150 mile race that kicked off on Friday at noon. My friend Ryan Dexter was running in it so I arrived in Pekin a little early on Friday to cheer him on. The trail was in awesome shape. With the exception of the year before, when I went and paced for my buddy Tommy, I'd never seen it look this good. After I chatted with Ryan a bit, picked up my packet, and said hello's to some fellow runners, I headed off to the hotel to eat and get to bed early. I ended up sleeping a little more than usual the night before a race and felt good when I woke. The weather still was holding up nicely. It was about 60 degrees and overcast. I chatted with my buddy John (who went on to win the 100) and some other runners before the gun went off. I knew I was going to race, not just run, today so I started up towards the front just to make sure to stay out of the crowds on the we hit single track a mile in. I settled into a mostly comfortable pace. Pushing a little, but not over-doing it. The trail was in even better shape than I could have hoped. I had EFS drink and liquid shot along for the ride. Drinking when thirsty and taking a shot of the EFS every 1/2 hour. It had started raining around 7am. I hoped it would be just a little or slow down. That was not the case. I hit my first lap around 1:32. My wife had made up a 2nd bottle of EFS drink for me and laid out 3 Clif Shot Gels for me. I grabbed those up quickly and got back out. My second lap was almost identical to my first except it was pouring and I knew things were going to get ugly. I crossed mile 20 at 3:06. The third loop was getting a little sketchy. See, there is not a lot of rock under trails in this part of the country. The ground is made up of top soil layered upon clay. Once water gets on it, it just turns to goop, then after that top soil is removed from foot traffic you get to the clay which is really slick when wet. I just kept charging as well as I could on lap 3 and fell off a bit but was still feeling great. 30 miles down in about 4:46. Lap 4 was a rough one. The trail was a slop hole. The flat spots were several inches deep with mud and the steep climbs were so slick it was like ice. Imagine a 20% grade with no traction where you are pulling yourself up by grabbing roots and saplings on the side of the trail. Because there were several spots like this the 150 miler were having a rough go since they'd been out there for 12+ hours already and the 100 milers were less than half done so I did my best not to complain and just get though it. Mud like this is demoralizing. It takes away your ability to move efficiently. Hills that I had the legs to run up were now almost impossible to do anything more that walk up. Even walking was a lot of energy. Take a step and it would slide back a bit, take another step, same thing. Downhills were sort of like skiing. Keep your knees together, sit back a little and "Pizza/French Fry" your way down. Oh well, that's trail running right? Smile and get though it. Lap 30-40 was a 1:52. A major drop-off from the previous but mostly because of terrain. I had a bit of a low spot somewhere during this lap but overall my legs still felt capable. I came though the Start/Finish, high-fived my daughter, swapped bottles, and kept chugging away. I knew my sub-8 hour goal was out the door but I had that in my mind as a "if everything was right" and with the mud that was not the case. Nothing special here on this last lap. I really just wanted to get it over with so I ran in all the spots that I could (not very many) and made sure to thank all the aid station workers for their help and support throughout the day. Running in the rain and 60-70 degrees is not bad because you are moving and generating body heat. Standing around and serving food and drink in that can be miserable and cold. Thanks folks it was greatly appreciated!! I crossed the finish line in 8:37 and some change and took 2nd (100 registered, not sure how many started). This was the highest I've ever finished in race and it felt good to have run the time I did given the course conditions. My legs felt good the whole time which is a testament to my training and investment in a coach this year. Thank Matt Hart! (@thematthart). I knocked 2 hours and 47 minutes off of my initial 50 mile time on the exact same course in a 5 year span. I'm fairly certain that number would have been over 3 hours if not for the course conditions. Why does that matter? In terms of stats to the outside world it doesn't. No one really cares about my times except me. However, I can look back and see a huge leap in ability that has taken place by training consistently, working hard, pushing myself by training with runners more talented that I, and learning along the way. I'm still smiling thinking about how far I've come and how much fun I have had doing it. A BIG BIG BIG shoutout to my awesome wife Micaela who has supported me in this passion over the years. I could not do this without her.